By Dennis W. Viau; modified from a Moroccan cookbook. The cookbook labelled this as “a bachelor’s dish.” I think it’s suitable for anyone who likes beef and a little extra spice. The flavor is mild though. 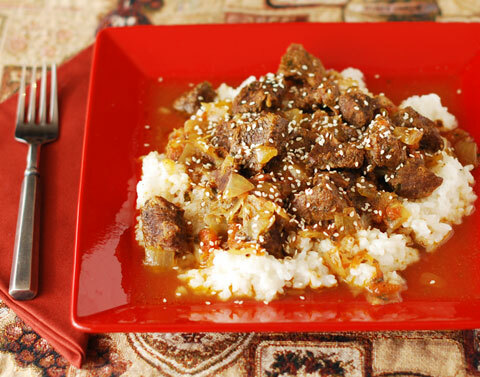 This dish is also economical because you can use an inexpensive cut of beef. 1 kg (2 pounds 4 ounces) chuck steak or other stew beef. If the beef is not already cubed, cut into 1-inch (2.5cm) pieces and place in a deep roasting pan or a casserole dish. Combine the meat, chopped onions, garlic, oil, ras el hanout, harissa, and black pepper. Stir, cover, and let sit for a few minutes while you prepare the other ingredients. Heat a pan of water (enough to cover the tomatoes when submerged) to boiling. Cut an X in the bottom of each tomato and immerse in the boiling water for about 30 seconds to loosen the skin. Remove the skin and discard. The tomatoes can be cut in half and seeded. You can also strain the seeds, returning the juice to the tomatoes. Add the tomatoes, about 2/3 of the lemon zest (reserve the remainder for garnish), and honey to the beef. You can also add the juice of one lemon. Chop the coriander and parsley and add to the pot. Remove from the oven and let rest while you prepare rice or couscous on the side, if needed. (You could serve this stew in bowls with bread on the side.) Taste the stew and adjust for salt, if necessary, before serving. Plate and garnish with the remaining lemon zest or sesame seeds. Ras el Hanout: A little research shows that there is no one recipe for this spice blend. One cookbook says that each spice merchant has their own ideas for the perfect blend. You can buy the spice in some grocery stores or look on the Internet for recipes. You’ll find many and they differ widely. I use (all spices are ground): 2 teaspoons each of ginger and coriander; 1½ teaspoons each of cinnamon, black pepper, and turmeric; 1¼ teaspoons nutmeg; 1 teaspoon allspice, and ½ teaspoons cloves. Combine in a jar and store in the cupboard. You can grind your own spices if you have an electric coffee mill. Harissa is a Tunisian spice blend paste, best stored in the refrigerator. I make mine by using: 3 tablespoons chili powder (I prefer sweet California mild chili powder), 1 tablespoon dried mint leaves (you can dry fresh mint by hanging it by a string for several days), 1 tablespoon ground coriander, 1 tablespoon ground cumin, 1 tablespoon ground caraway seeds (this might be difficult to find; so grind your own), 10 garlic cloves, ½ cup (125ml) olive oil, and 3 tablespoons tomato paste. Blend well and store in a jar in the refrigerator.